This time, Amazon is offering free delivery on the first order for all new customers, and those customers (new and existing) who Shop for Rs 500 or more on the first day of the sale will be eligible for a free movie, free meal and a recharge. 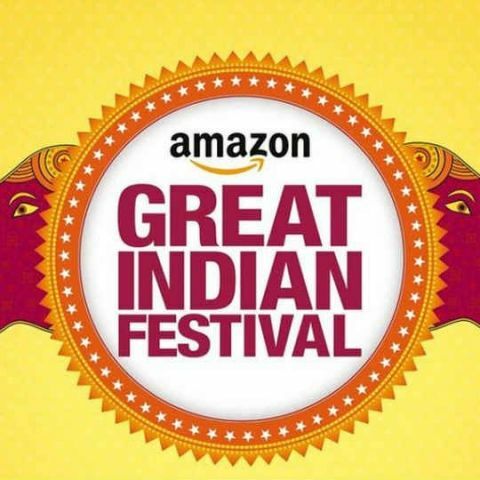 Just ahead of Diwali, Amazon is hosting Wave 3 of its Great Indian Festival Sale from November 2 midnight till November 5 11:59 pm. The e-commerce platform will offer deals on products ranging from smartphones, large appliances and TVs, home and kitchen products, fashion, consumables such as grocery and beauty as well as consumer electronics. To attract more footfall on the platform, Amazon is offering free delivery on the first order for all new customers. To make it easy for customers to save more, Amazon is offering 10 percent instant cashback on HDFC Bank Debit, Credit cards and EMI. Additionally, there is an up to 10 percent cashback with all online payments on total order value. There is a No-cost EMI option on Bajaj Finserv EMI card, Debit and Credit cards, and special Exchange benefits. Product-wise, the platform says that consumers can look forward to buying the OnePlus 6T during the sale period. It is also offering top deals on the newly-launched Echo 3rd generation devices and the Fire TV Stick. Customers can get up to 50 percent off on Alexa built-in devices such as speakers and headphones. Kindle eBook bestsellers will start at Rs 19 and an annual subscription of Kindle Unlimited will be available for Rs 1,488 after a flat Rs 900 off. Amazon claims that the Xiaomi Redmi 6A, which will go on a flash sale every day at 12 noon during the sale period and will be available at its lowest price ever. Mi TV (49 inch) will go on a flash sale at 11 am every day of the sale. Customers can also enjoy 50 - 80 percent off plus a fashion bonus offer of extra 10 percent cashback on Amazon Fashion, offers and extra 15 percent cashback on Amazon Fashion, up to 80 percent off on Home and Kitchen products, up to Rs 25,000 off on laptops and up to 70 percent off on men’s grooming products. “Our month-long celebration continues with wave 3 of our Great Indian Festival offering customers the best selection and biggest deals on our entire selection. With No-cost EMI on Debit and Credit cards and Bajaj Finserv Cards, fast delivery and installation of appliances, exchange of mobile phones and large appliances, instant bank discounts, exciting cashback and lots more, customers can look forward to an exciting celebration on Amazon.in,” Manish Tiwary, Vice President – Category Management at Amazon India, said in a statement. Those customers (new and existing) who shop for Rs 500 or more on the first day of the sale will be eligible for a free movie, a free meal and a recharge, Amazon has announced. All eligible customers will get 100 percent cashback coupons on Swiggy, BookMyShow and mobile recharges on Amazon.in. Customers can also get up to Rs 2000 back on select Amazon Pay partner merchants like Redbus, Faasos, EaseMyTrip and Netmeds by shopping on the Amazon shopping app and paying through any online payment method.